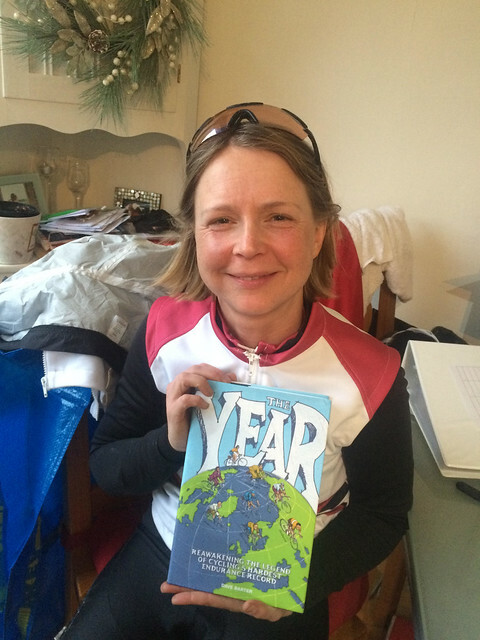 Kajsa and her January YCC prize. well done. Kajsa gets stuck into her book, as seen in this VIDEO. For the weekend she teamed up with Steve A for a couple of wet and wild rides and had a quieter week generally, plenty of time for recovery while reading about record holder Billie. It started off as a very quiet week but by the weekend the table swelled as 36 separate riders passing the mark. The wind didn’t stop JP and Tony B grabbing 3 each, and 4 other riders getting 2, Mike K once again in one monumental 200 mile ride. Several riders battled the elements for Audax 200K rides; Shell and Ricki G at “Straight on at Rosies” with a particularly cruel return back into the teeth of Sat nights gale, while Mike C and Shaun H joined in with a very wet day out of Tewskesbury. This entry was posted in YCC and tagged Century challenge, Kajsa Tylen, YCC.